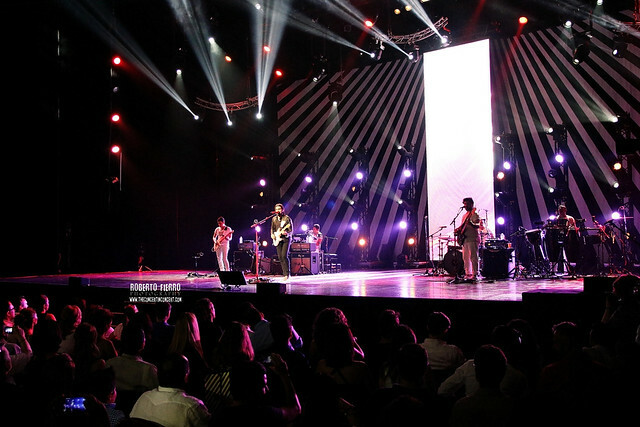 Recently we were contacted to create a set of two unique backdrops for the tour of Latin Grammy award-winning artist Juanes. The client’s designer sent us several renderings depicting variegated black and white diagonal stripes and asked us to suggest ways to achieve the effect with fabric. We offered several options, including digitally printed and mixed media options, and talked through the options with the client, who then selected a mixed media option which combined black fabric backdrops with appliqued white fabric diagonal stripes. 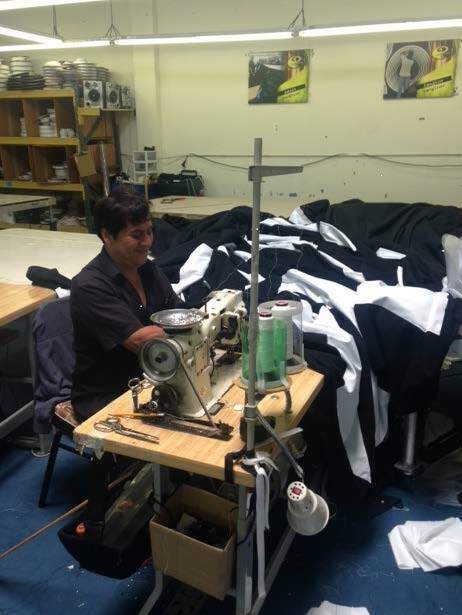 After considering several ways to approach this project, our talented sewing staff got to work by making two flat backdrops from Black IFR 22oz Encore. Then on the face of the sewn Black Encore backdrops, they laid lengths of White FR Heavy Knit. Though Heavy Knit is typically used as a substrate for digitally printed backdrops, in this case it was selected to be used in its unprinted state due to its width (10′ wide), knit construction (which minimizes wrinkling), and bright white color. Then came the tricky part. 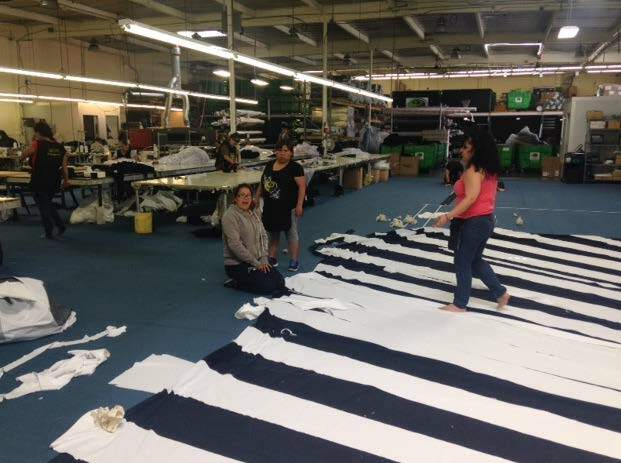 Utilizing tape measures and painters tape, our sewing crew painstakingly recreated the variegated stripe pattern onto the White Heavy Knit and pinned the sections into place on the face of the Black Encore backdrops. The next step was to sew the Heavy Knit stripes onto the Black 22oz Encore backdrops, using the painters tape as a guide by sewing just inside each length of tape to create each appliqued white stripe. The final step was to lay the appliqued backdrops onto our manufacturing floor, where several members of our sewing staff carefully cut away the excess White Heavy Knit from the face of the backdrop (making sure not to accidentally cut the Black Encore as well), thus revealing the finished black and white stripe pattern. This was certainly a challenging project, but as usual, our sewing staff rose to the challenge, and I think the finished project shows what a great job they did. The finished backdrops looked great hanging in our manufacturing facility, but what is really fantastic is seeing how incredible they look live on stage with Juanes! At a time when so many goods are being produced overseas, American theatrical drapery manufacturer Sew What? Inc. is making the point that Made in America is still a good thing. We believe in delivering top value to our customers while doing all we can as a company to support the national economy by selecting local fabric mills right here in the U.S.
All of our stage and concert backdrop fabrication is done here in Rancho Dominguez, California, and we use American-made materials produced by American mills to the maximum extent possible. Only when a particular product is not made here do we look to find it offshore; and even then we try to get our local suppliers to produce it onshore if they are able. 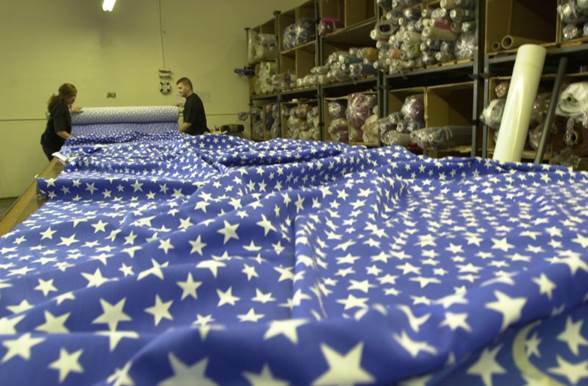 As a U.S. soft textile manufacturer, we take pride in applying “Made in America” labels to our stage backdrops and theatrical drapery products, showcasing that they are all-American-made. I feel it’s imperative that we as Americans make the effort to support and purchase products made in America by an American labor force. Every time a U.S. mill closes, the chances of another U.S. mill opening in its place are slim to none. So it’s up to us to make every effort. It is either act now – or cry later. We have spent many years calling upon the entertainment industry, our primary source of business, to rally behind the effort to buy American-made products and support U.S. companies as much as possible. 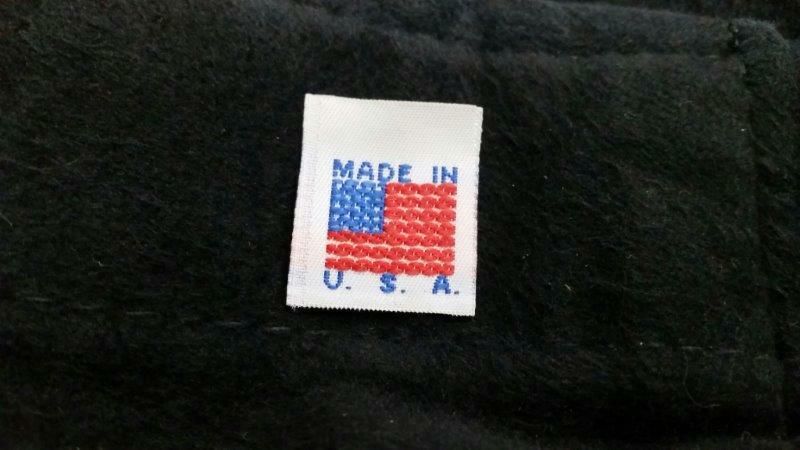 There was a time when “Made in America” really meant something, but sadly it’s come to mean products that are more expensive. We all hope that the efforts of Sew What? to buy and continue manufacturing in the U.S. will be duplicated by others in our category, as well as elsewhere. We are working diligently to keep our pricing in line as much as possible – so that the global marketplace is not made attractive due to buy price alone. In addition to encouraging local suppliers to produce materials and fabrics that are currently only available abroad, we have even spoken with several overseas manufacturers about the possibility of producing their fibers here in the U.S. The global economy and the financial incentives of buying offshore have made U.S. production more fragile than ever. At least in our little corner of the world, we want to do something meaningful and supportive, and we’re proud of it. All fabrics are handled differently when it comes to flameproofing. If you have old backdrops, and don’t know what the cloth is or when they were purchased, you will have some difficulty in identifying whether or not they are potentially hazardous for use in a product targeting individual end users in the retail marketplace. An IFR fabric backdrop would most likely not have any chemical on it – as IFR materials are woven of a cloth that is “of a flame resistant fiber”. However you may have pyro dust or any other potentially toxic hazard that has attached itself to it during use on the road. A cotton fabric would, or should, have been sprayed or dipped. It could be a chemical from any number of different flameproofers. Even the most eco-friendly of chemicals aren’t going to be designed for use up against the skin. Each flameproofing supplier mixes and make their own chemicals. They have changes over the years as testing requirements have also changed. As such, something treated by a New York flameproofing service would be a different chemical to something treated by one in Los Angeles. I personally would not want to put any of these flame retardant fluid treatments “directly” against my skin or pack my lunch into a bag with a chemical treatment on it. A poly mix fabric may have a chemical on it – that depends on many factors – most polyesters are treated with different chemicals to cottons! In short – we suggest that ANY backdrop you intend to put into the “consumer marketplace” be sent off to a commercial washer / launderer – and be vigorously laundered (several times – up to 5 washes may be needed to remove residue) to remove any and all chemical residue. Despite laundering, and due to the potential risks involved with these types of chemicals, we don’t recommend re-purposing of backdrop materials into items that will be in contact with skin or food directly. Yes – there are some companies out there that do this type of thing. 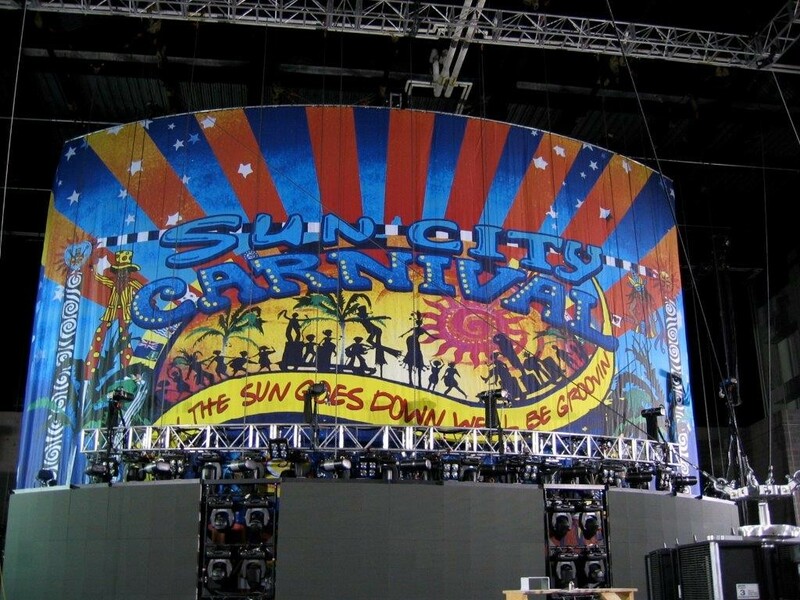 Back in the day they were mostly recycling / repurposing VINYL banners and backdrops – which by the way would be the one and only printed product that would be relatively safe to re-purpose as there is little to no likelihood of a topical treatment having ever been applied to them. If you do decide to use one of the online companies to convert your old backdrops into saleable products for your fan club, we suggest that you insist they launder the goods prior to sewing them. Especially if you plan on putting them in the marketplace as tote bags. It would be a shame to be “doing good” and at the same time end up with a bigger issue. 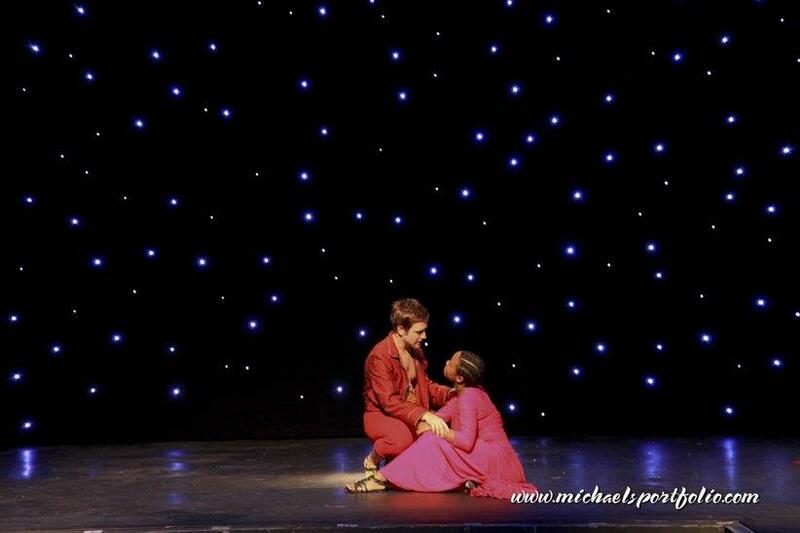 When we treat and sell backdrops, they are sold with an intended use. That is as a backdrop! When you sell a tote bag, it is far more difficult…. As you can’t really sell it or gift it and say “oh, by the way – don’t put food in it, or your baby clothes….”. 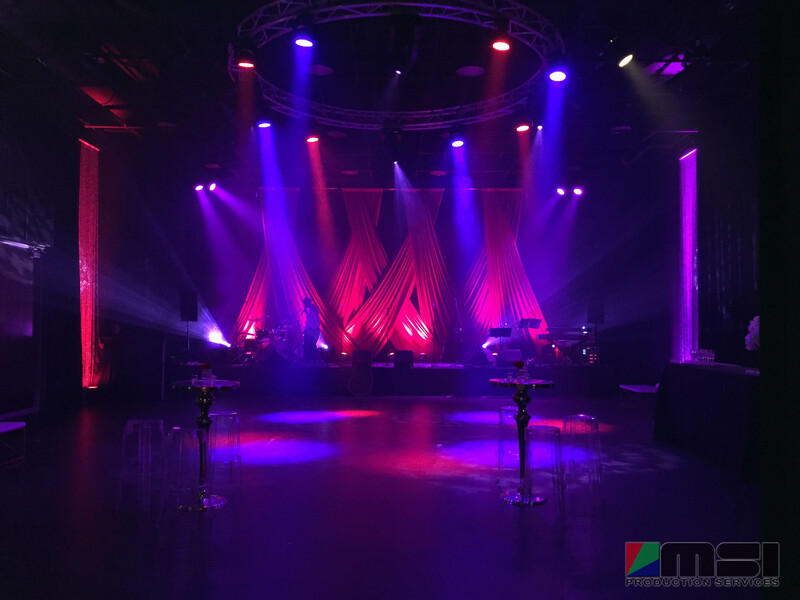 Choosing the right custom-built soft goods can sometimes be quite daunting–there are many factors to consider, in the hopes that not only will you be able to use them for your special event, but also for future event designs as well. Color, fabric, fullness, seams, lining, and cut can all make a huge difference with the overall look and versatility of your draping. That’s why we have a team of experts here at Sew What? Inc., on hand to help guide our wonderful clients every step of the way! Recently we were thrilled to work with one of our most creative clients, event designer Luke Gulley, who needed some soft goods built for a very important event down in San Diego, California that he and his team from MSI Meeting Services, Inc. were designing. 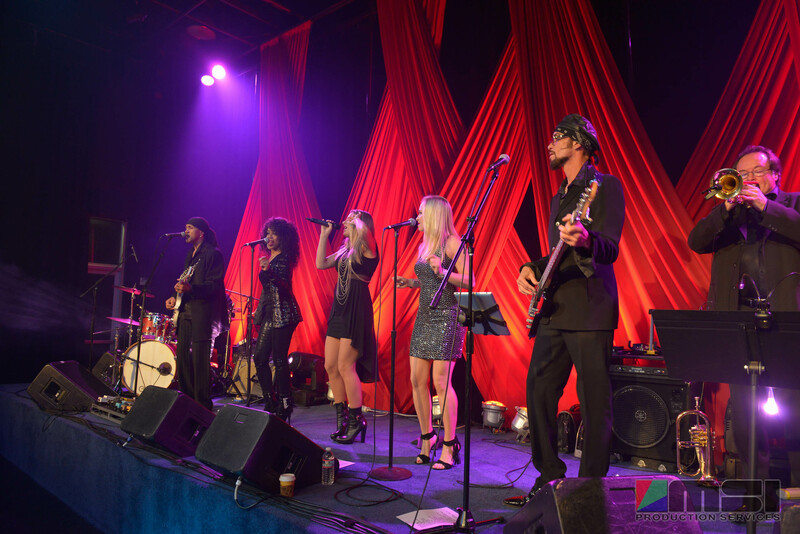 They needed to create a beautiful and dynamic staging motif and décor for the Tony Award-Winning La Jolla Playhouse’s 2015 Annual Gala, which helped raise over $1.5 million for its Educational Outreach Programs and New Play Development Programs. Working with our Creative Director Shane Nelsen, they came up with some gorgeous multi-purpose drapes that completely wow’d the crowd! 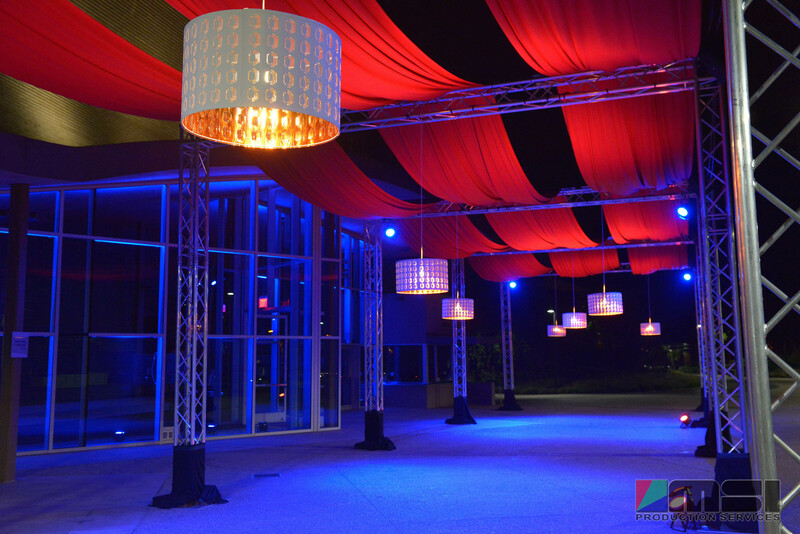 Cranberry Party Knit Ceiling Swags helped set the mood and guide the party guests through the entrance way and into the main event. Then Truss Arch Swags and Drape Panels perfectly dressed the stage for the band’s electrifying performance. Both styles of drape were built with 5” pipe pockets along the top and bottom of the drapes, which helped give Gulley and his design team plenty of options when it came to decorating, allowing their design vision to completely come to life. Photographed spectacularly by both Gulley and in-house photographer Daniel Norwood, you can see what a dramatically breathtaking ambiance these drapes helped to create for this very exciting event. And because these drapes are in “neutral” shades of red, they will be able to use them time and time again for many special events to come. Need Some Sparkle on your Stage? LED Stardrops “Bring the Bling” to your Production! We get lots of calls asking us about our LED Stardrops. Are they affordable? Are they easy to use? Will the audience be wowed? The answer is simple. YES, YES and a resounding YES! Our rental inventory is home to lots of durably constructed LED Stardrops. We carry both the Classic “white light” version as well as the popular special event “color changing” (aka Chameleon) version. In terms of affordability – you can cover a 15 foot by 30 foot wall space with a white light stardrop for a little over $400.00 (excluding shipping) – and that gets you a full week’s rental to use the product! The fabric panels are a black Encore Velour with a solid lining. You can very easily stack or assemble multiple units to cover larger areas. User friendly Velcro makes for a seamless drape combination. The wiring is all tucked neatly inside. Easy to ship, you will find that these are a great value. We have this cool sliding scale for pricing – so those keeping our inventory over a week will enjoy 50% discounts on weeks 2 through 8. Keeping it over 2 months? Not a problem. Even deeper discounts will apply when you hit your 9th week. We are all about affordability – and easy extensions for contracts. The Chameleon Color Changing Stardrops have all the colors of the rainbow at your fingertips… ready to flood the stage with twinkling bold blues, warm ambers……….the sky is the limit! SO easy to use – each unit comes with its own simple to understand hand controller that lives with the drape. For parties and event setups where you just want to “turn it on and forget about it,” these are just ideal. Need to run it through a lighting board? Want more control over the speeds, intensity or colors? That’s also simple – as the controllers are DMX addressable. Simply run your board to the drape-side controller with an XLR cable and take over the programming and control from front of house. Here are some photos that show the value! Every audience will love the excitement that a stardrop brings to the stage. 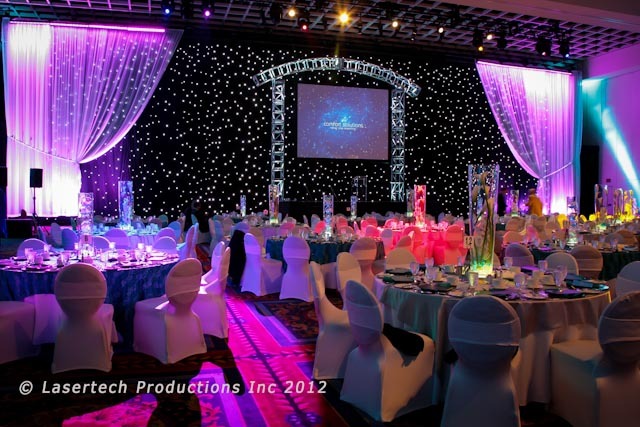 Our gorgeous twinkling LED Stardrops are available for RENTAL or PURCHASE. These easy to use and programmable sparkling lights add a skyline full of interest and color to your event. Let us know what you are looking for and we will gladly put together a quotation for you! Contact us for more information at 310-639-6000.